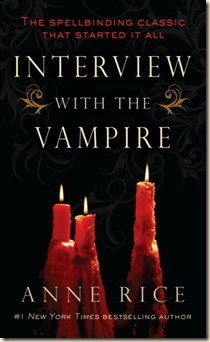 I have been a fan of Anne Rice’s Vampire Chronicles ever since I picked up Interview with the Vampire in 1999. I was living in New York at the time, and I went to Barnes & Noble on 51st & Lexington (in the CitiCorp Building), and came across the series. Even though I hadn’t read any of the novels, by this point I had seen the movie, starring Tom Cruise, Brad Pitt, Antonio Banderas, and a scene-stealing Kirsten Dunst. I really enjoyed it (and still do), so I thought I’d give the series a try. I proceeded to read all of the volumes then in print, and then bought each new book on day of release. I didn’t think the first novel was perfect, and I found the fact that it was written as a conversation slightly strange – I was young and not very well-read or refined at the time. Nevertheless, it planted the seed that has had me eagerly await any new book by Anne Rice ever since. 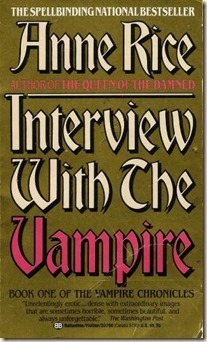 I consider the first two sequels, The Vampire Lestat and Queen of the Damned, as one of my five favourite novels of all time (I can’t read one without immediately reading the next, so I consider them as a single book). I thought it was interesting that Rice said she’s “not sure a review can kill a book today”. I think she’s probably right. Not only is the internet allowing critiques, criticism and praise to spread all over the world, but also the fact that negative reviews only seem to generate extra interest in books. Take two (admittedly unusual) examples: 50 Shades of Grey, or Dan Brown’s The Da Vinci Code (which got, effectively, a bad review from the Vatican = publisher’s Holy Grail). I also think Braudy is wrong his statement that “there is no story” in the novel. There’s quite a lot, actually. Yes, it’s “static”: it’s a book-length interview. What was he expecting? I don’t understand the Spider-Man connection, but it stands out, no? I don’t know the other references he presents, so I can’t speak to those. The connection to The Exorcist is an interesting one, but I don’t know either the book or movie version of that story well enough. I’m sure this would have been a more interesting post if I’d had access to the review, but there we go [and if I hadn’t been writing it during a bout of insomnia, at 3:30am]. I’ll keep trying to get the text, and see if it adds anything to the discussion. Or, at the very least, offer some interesting quotations from it as/when I find them. What do you think? Can negative reviews kill books today? If not, why not?